Madie (my sister-in-law!) 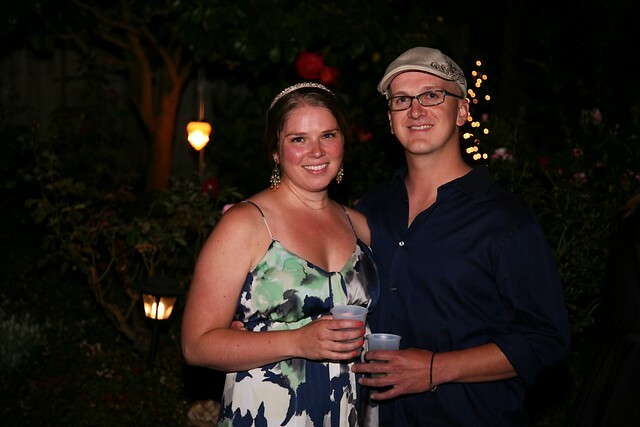 and her fiance Alex had a fabulous engagement party in Berkeley. 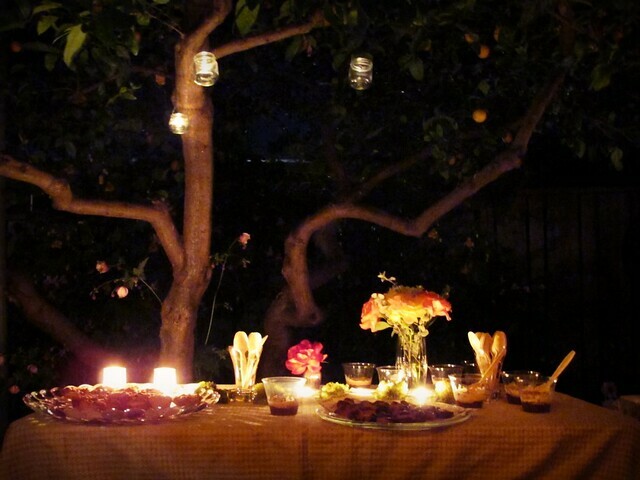 The theme of the party was A Midsummer's Night Dream, inspired by the fact that Alex recited one of Shakespeare's Sonnets when he proposed. 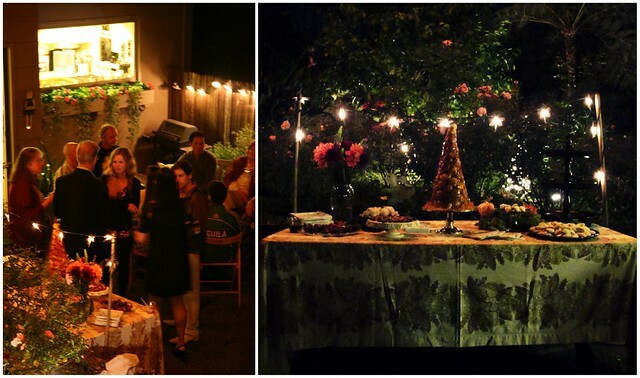 Alex's mom, Becky, has a gorgeous patio and garden that was the most beautiful and perfect setting for this soiree. Madie pulled together a little party planning committee (me included!) to divy up all the dirty details. And, Man-o-Man... these ladies pulled through and helped bring Madie's vision to life. It was really a magical night. Madie looked stunning. 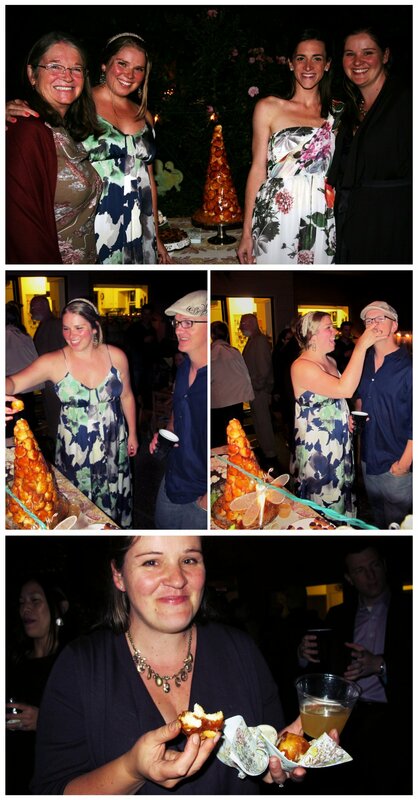 She and Alex seemed so happy, surrounded by good friends and family. 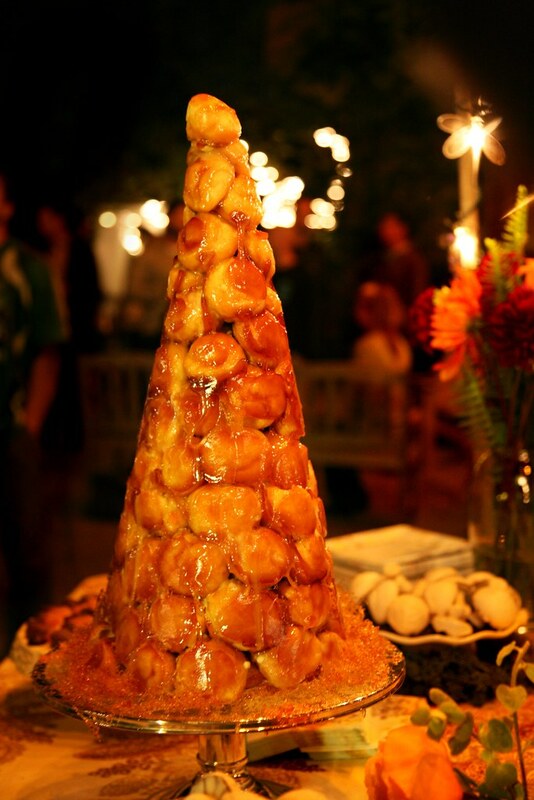 My contribution was Croquembouche, which is an intimidating tower of profiteroles (custard-filled pastry puffs) held together by crisp caramel and prayers. It's a French dessert often served at weddings and one that I have been wanting to make for a little while now. I just needed an appropriate occasion. Ok, I will admit... the task of the Croquembouche started to haunt me a little bit as Madie's engagement party approached. I don't know why -- perhaps the last minute preparation it required, all the ways it could go wrong (plenty of blog horror stories out there helped feed The Fear), or the sheer French-ness of the word that automatically made me feel inferior... I think the hardest part for me was that I truly wouldn't know whether or not I had SUCCEEDED until I arrived at the party and removed the poster cone lined with parchment paper. I'm so happy to report that it stood. 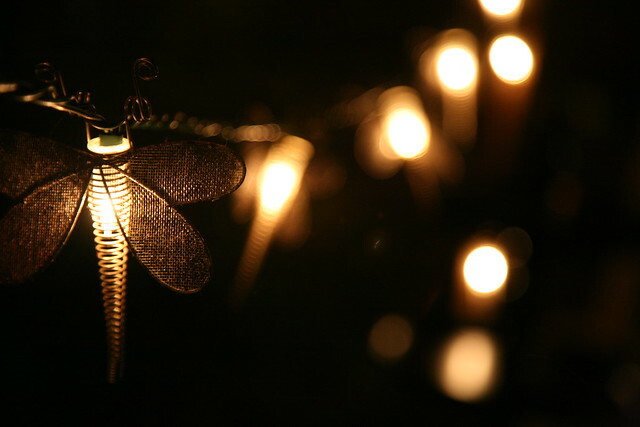 It glisted in the candle light. And it was damn near straight. It also was eaten and enjoyed -- all the way until the next morning I'm told! What's funny is that, Now, I'm like "Oh, yeah, Croquembouche. No big deal." I'm so not afraid of it anymore. I'm actually looking forward to getting a chance to do it again. I don't really even know why I made such a big deal of it in my head before. But I definitely can't sit here and pretend like I didn't turn into a HUGE BABY about making this Croquembouche. One thing that ended up inspiring and motiving me closer to the finish line was this video. I just tried to pretend I was this guy when I was assembling my profiterole tower....rather than the hot mess I actually was in my party dress and caramel coated kitchen. 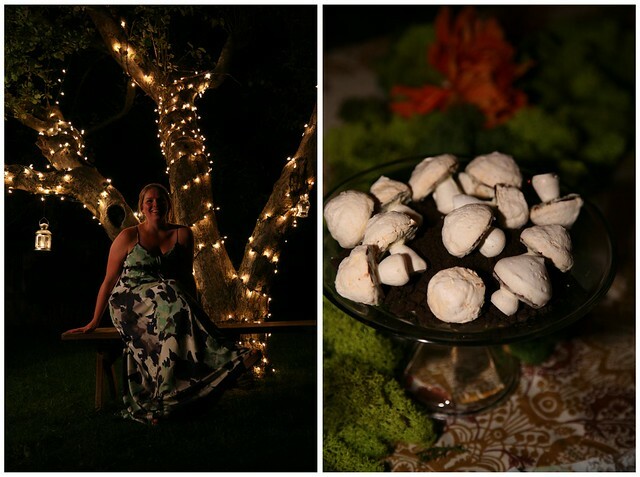 I also made meringue mushrooms and displayed them in a patch of faux dirt (crushed oreo cookies). The lighting was dreamy, a team effort speared by Mark & Vale. 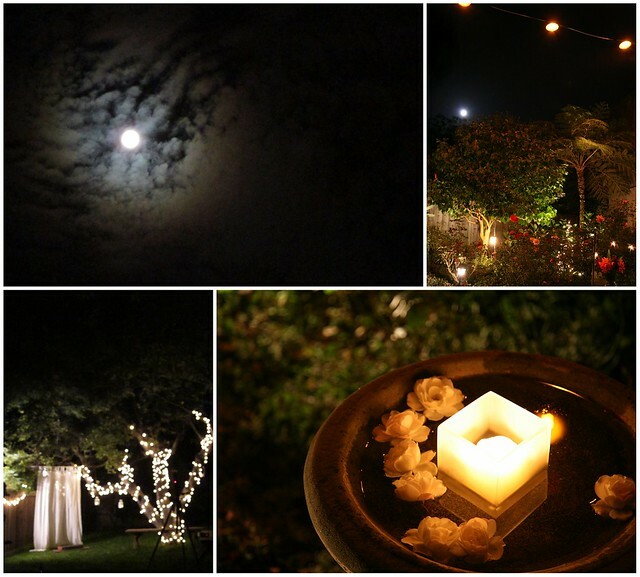 Even the moon cooperated with the bride-to-be. 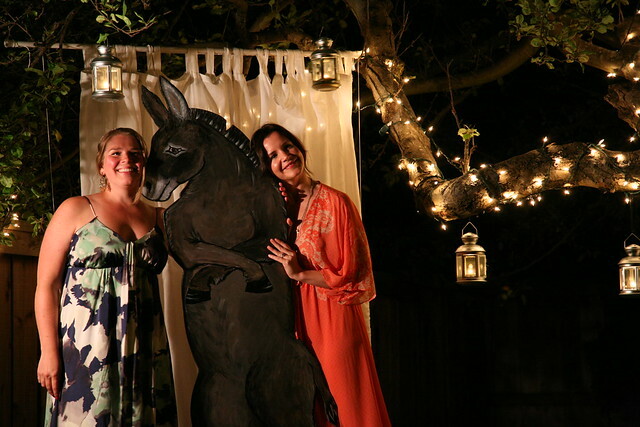 Oh, and, Vale pained this freakin' DONKEY as a prop for a photo op corner. NBD.